Official correspondence between the Post Office and Toppan Carpenter reveals that the decision to print 30¢ stamps in orange followed a printing in black on stamp paper. The existence of imperforate 30¢ Black stamps created controversy years ago, when some philatelists argued that the black stamps were a legitimate issue. A brief history of the early approval and production process is worth telling. In May 1860 President Buchanan's postmaster general, Joseph Holt, issued a new order requiring prepayment by stamps on transient printed matter, and on all foreign and domestic mail, except letters permitted to be sent unpaid by international postal conventions. Holt's order sparked public demand for stamps, especially in denominations greater than 12¢, the top value in circulation at the beginning of 1860. In response to a letter received from the Philadelphia postmaster, the new Third Assistant Postmaster General, Alexander N. Zevely, contacted Toppan Carpenter about producing new high-denomination stamps. The 90¢ stamp was the first denomination of its kind and the highest issued in the United States from 1847 to 1893, when the dollar-value Columbian stamps were issued. The reason for a 90¢ stamp--30 times the 3¢ domestic rate--is explained in a letter from Zevely, who thought it was "necessary to have a stamp in the denomination of Ninety Cents--not only to suit that particular rate of postage, but to prepay packages, to the amount, sometimes, of several dollars." Toppan Carpenter and Zevely engaged in some back and forth discussion about the design. The printers based their engraving, a three-quarter portrait of a youthful Washington in military uniform, on one of several similar full-length portraits painted by John Trumbull. Zevely did not like it, but soon acquiesced and approved the novel design and chose the color blue, which was described as "the handsomest of them all." Philatelists agree. The 90¢ stamps issued in August 1860 were one of the Civil War's early casualties. 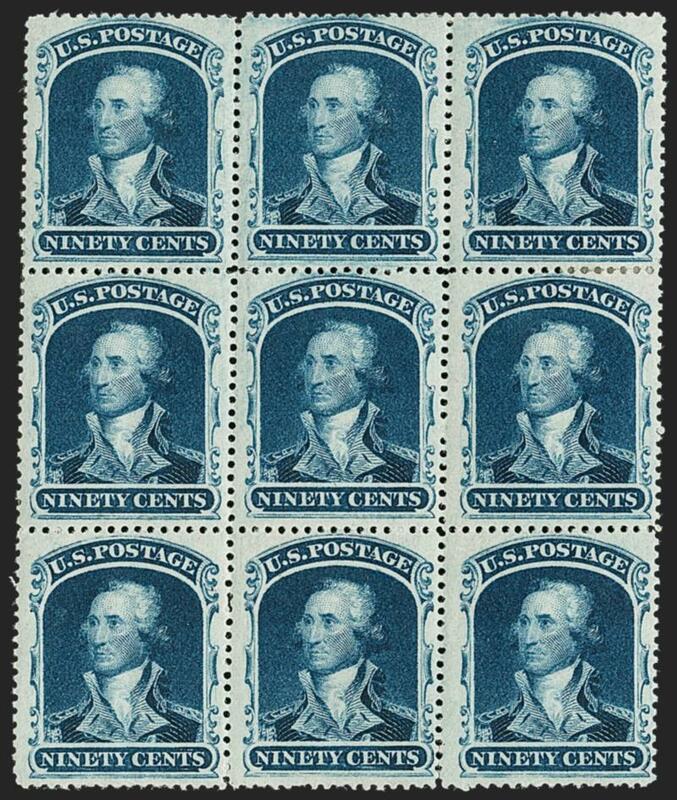 In August 1861 the federal government demonetized all previous issues of postage stamps and replaced them with new stamps that would be distributed only to post offices in loyal states. The purpose of demonetization was to prevent the South from using stamps as a medium of exchange. Demand for the high-denomination stamps in 1860 was limited, and the Civil War demonetization policy cut their lives short. Unused examples would be great rarities today if not for a cache of sheets discovered in Washington, D.C., which had been found in Southern post offices after the war and returned to the Post Office. These sheets were sold and traded to stamp dealers, and many of the unused 1859-60 issues come from this source. 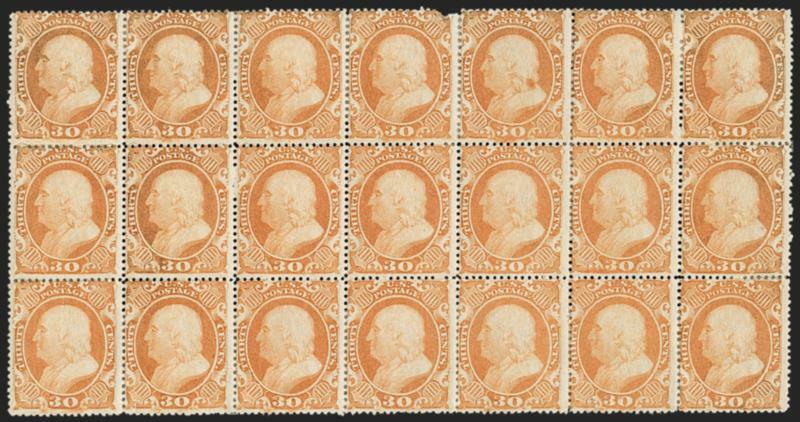 There are three recorded original-gum blocks of nine of the 90¢ 1860 Issue, which survive as the largest recorded multiples following the division of the Caspary block of 21. The Caspary block (lot 817 in the 1956 sale) was still intact when it was part of the Benjamin D. Phillips collection, which the Weills acquired in 1968. Sometime after then, this block was divided into a block of nine from the center, two blocks of four from the bottom left and bottom right corners, and singles or pairs from the corners.